When you have a sophisticated model set up in Excel you'll often want to alter the input values to test what effect it has on the outputs. Scenarios are designed to help you quickly switch between different sets of inputs for a model without having to manually type in different values time and time again. 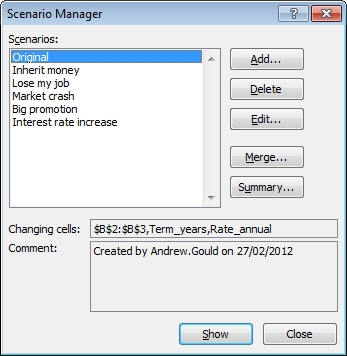 You can watch a video version of this scenarios tutorial, or see a full range of resources for our Excel training range here. This simple model contains four input cells (the yellow-shaded ones) and four calculated cells. You can download a copy of the file used in this tutorial by clicking here. Scenarios work best when you have used range names to refer to the input cells. If you're not sure how to use range names in Excel it might be worth reading this blog first. Range names aren't essential in order in to successfully use scenarios, but they do make the process much easier! Go to the worksheet containing your input values. To begin with you won't have any scenarios in the worksheet. The next step is to add some. Click the Addï¿½ button to add a new scenario. Complete this dialog box to create a scenario. The numbered steps are explained below. 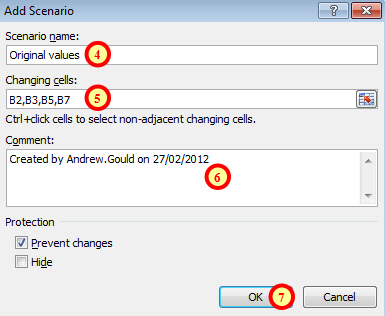 Choose the cells whose values might change in different versions of the scenario. Here we've picked the four cells that we highlighted in yellow. Each scenario can have up to 32 changing cells. You can optionally add a description - the one shown here is the default. 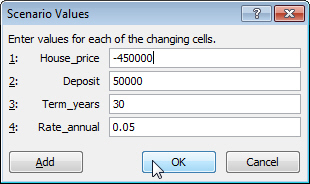 Click OK to move on to the next dialog box and enter the values for the scenario. Enter the values for the different cells - here you can clearly see the advantage of using range names! When you have finished entering values for the input cells you can either click Add to immediately create another scenario, or OK to go back to the Scenario Manager dialog box. 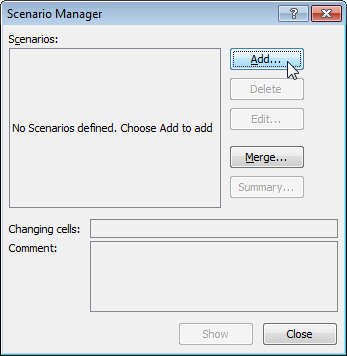 When you've finished adding scenarios you can see a list in the Scenario Manager dialog box. Here we've created six scenarios, each with a different set of input values for our model. Now that you've created some styles, the next step is to view the results. The next part of this series shows you how to do exactly that, as well as showing you how to add an extra option to your toolbar to make viewing scenarios even quicker.